Nostalgia is a wonderful thing. It’s been shown to counteract loneliness, boredom and anxiety. When sharing nostalgic memories we feel closer and happier. e when you’re of a certain age. The closest to Woking (and the easiest to visit) is the Mid Hants Railway, affectionately known as The Watercress Line, which runs 10 miles (16 km) from New Alresford to Alton in Hampshire. With its heritage steam and diesel locomotives, period buildings, signal boxes, footbridges and semaphore signals, you can leave today’s tech-busy world behind and immerse yourself in an earlier age. A ticket on the Watercress Line gives you unlimited travel all day. Many trains are steam-hauled – there’s nothing like the “chuff-chuffing” of a steam loco to evoke an earlier age. The staff whether on trains or stations are all volunteers whose enthusiasm for the railway is infectious. You can even get there by direct train from Woking: South Western Railway’s station at Alton is adjacent to that of the heritage line, with lifts crossing intermediate platforms so those with limited mobility including wheelchair users can have step-less access to trains. 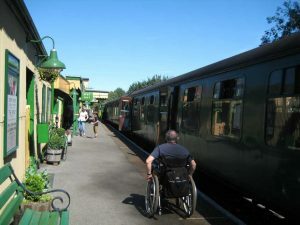 They have tried to make the railway as accessible as possible but, given the nature of the line’s many heritage buildings and rolling stock, accessibility is not always feasible. They offer a ‘Free Carer’ ticket’ to compensate for restricted access to some facilities. (These are not available for Real Ale Trains, Dining Trains or Santa Specials.) Wheelchair accessible carriages are available: railway volunteers are delighted to advise and assist you. Each of the four stations is set in a different era and is full of period charm. 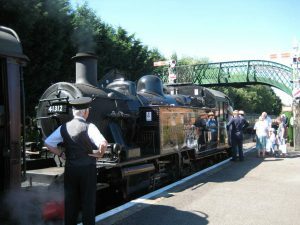 Be sure to visit Ropley, one of the two intermediate stations where the railway has its restoration sheds in which locomotives and carriages are skilfully restored to their full glory. Viewing areas in the impressive engineering workshops allow you to see work in progress. A “Restoration Route” at Ropley takes you over an iron footbridge (moved here from King’s Cross station) which famously featured in the Harry Potter films, to the viewing galleries, past the loco yard and back to the period station. The walk is accessible to wheelchairs and baby buggies. The line is open every weekend from mid-February until the end of October, plus midweek from May to September. There are many special events too. 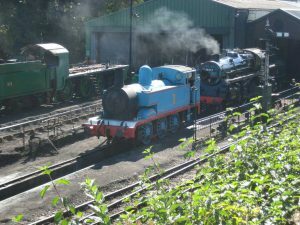 Before you visit, be sure to check the railway’s web site at www.watercressline.co.uk to make sure trains are running.